Register with Online Auto Dealer Ed and complete our online, State mandated course instantly online. Complete our 8 hour pre-license course. Print your certificate instantly from the comfort of your home. The printed certificate will serve as your proof of course completion. Complete the Florida DMV Auto Dealer Application and pay the DMV fee of $300. We provide the application online, in the classroom. Obtain bonding and insurance. We can refer you to a partner for this critical need. Obtain approval for your business location. Provide your proof of course completion (certificate), the Florida DMV application and proof of insurance and bonding to the DMV. 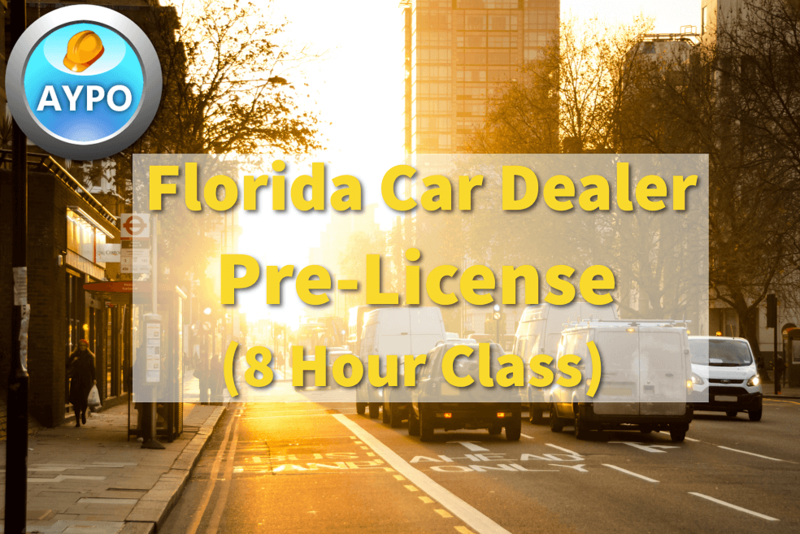 This course will meet the one time requirement for a franchised motor vehicle dealers (VF) license. Course material includes classes on dealer licensing and operations, compliance requirements, laws and regulations, and much more. At the end of your class you will receive your Certificate of Completion for filing with the DMV. Keith Haley is the Online Auto Dealer Ed instructor and industry expert for At Your Pace Online. In addition to his Oregon auto dealer's license, Keith holds a Bachelor's degree in Finance, Master's degree in Education, and is a Certified Financial Planner and licensed insurance producer. As an entrepreneur, over his career Keith has owned and managed businesses in a wide range of professions, including car sales, financial consultation, and insurance sales and management. With over twenty years of experience in business, sales, and education, Keith brings a broad range of practical and academic knowledge to our courses. Loved the online option. The tax section is grueling but other course material is very educational! This was a very informative class that truly helped me. Course was fine but it's a little outdated. The course was too slow. I could read and comprehend the material about twice as fast as it would allow me to move through the course. Made it very aggravating to wait on each section. Very long in between questions. Several times I lost my place and had to redo many pages costing me a few hours of lost time. There were several questions that I did not find in the course material.